Taylor Guitars' El Cajon facility is working to usher in the latest era of guitars and, thus, creators. In doing so, the company offers free tours of the facility to help strum up that interest. EL CAJON, Calif. (KGTV) — Nestled in a quiet East County business park, noise is created. Noise can mean a lot of things, but here it's considered sweet, sweet music. "For us as a company as we've grown, we've really wanted to give people a deeper appreciation for what goes into an instrument," Jim Kirlin, editorial director at Taylor Guitars, says. "It's cool because a guitar has a certain built-in coolness factor, people are already drawn to the instrument as it starts. But then on top of it, there's a mystery to it." During the tour, the company peels back the layers to that mystery of what makes a Taylor guitar. Guests are walked through everything from wood selection, fretboard construction, and modeling the shape of a particular model, down to the finer details and to final assembly. "We try to paint a pretty complete picture," Kirlin said. "We do things in a different way than other companies do. It's an interesting marriage of technology and hands-on attention to detail." 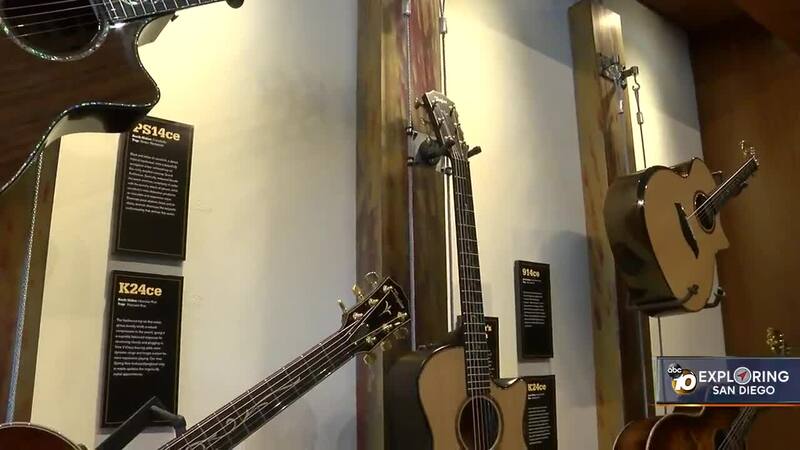 Kirlin said on the tour, guests will even look at the "sonic architecture" that gives a guitar its sound and how aspiring players can select their own instrument. "Whether you're that guitar player or you're just someone who's interested in how things are made, if you come and take the tour, you're going to really enjoy it," he added. And that work carries over into the San Diego community. Taylor Guitars also partners with the San Diego Music Foundation to help supply guitars to local schools. "We know that music education is really important to that next generation ... as a part of that community we want to do what we can," Kirlin says. "For years now, we've been helping put guitars into schools for instructors who do such a great job to inspire kids and to help them begin their guitar journey, begin their musical journey." And while schools may face budget constraints to arts and music programs over time, the interest in guitars isn't going anywhere, Kirlin says. If anything, he believes — like all new skills — practice makes perfect. "People wonder about is there a waning interest in guitar playing in the world. I think the reality is, there's certainly a lot of things competing for people's attention," Kirlin said, noting last year that Taylor Guitars made the most guitars in a year than ever in their history. "At the same time, I think as long as people are around, there'll be music around. "I think sometimes the barrier for people is not picking up a guitar, but sticking with it. Part of our mindset as a guitar company is to make guitars that not only make a great first impression, but also inspire people to keep playing."